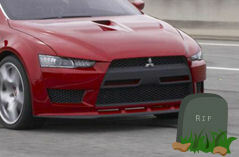 Home » Has Mitsubishi backtracked on ending Evo production? “Production of the current Lancer Evolution continues as planned. As for its successor, regulations and market feedback will dictate its engineering package & architecture. MMC has kept the Lancer Evolution sedan evolving as the brand’s highest performing model in the global market. However, as the market’s needs and demands change, MMC is considering not advancing the Lancer Evolution concept in the same way as before, but to find a different direction for the Lancer Evolution model to evolve. The new direction, the technologies involved, and corresponding products will be disclosed in due course”. Many in the Evo enthusiast community hoped this was a retraction but it is not. The current Lancer was already scheduled to end production in 2013 and therefore the Evo X would normally come to an end at that moment in time anyway. The question was what happens with the next Lancer and whether there would be an Evo based on that. And clearly the answer is no. Gayu Eusegi made the point that a follow-on Evo is not in the plans. Mitsubishi’s statement above simply says that current production will continue as planned, and since it’s based on the Lancer, and since the Lancer is due for a change in 2013, the Evo as we know it would have ended anyway. So this statement says nothing new. Whether the Evo continues in some form or another can hardly be a up for debate within Mitsubishi… given all the issues facing the corporation as a whole, the Evo is certainly the last thing on their minds and in their development budget. And the Evo, in which the floorpan, bodyshell, and every mechanical bit is different from any other Lancer, is certainly an expensive vehicle to engineer and build. North American sales of the current Lancer are simply terrible: the Lancer not competitive in it’s segment. Mitsubishi in North America is barely able to continue in the car business, and has side-stepped a horrendous union contract at it’s Normal, Illinois plant where the Eclipse and Galant are currently built. Neither of those cars are competitive at all, and a simple glance around the streets will tell you how poorly they are selling. So if Mitsubishi doesn’t have anything at all that is selling, can engineering a new Evo be a priority, much less a financial possibility? What a shame this is… the glorious tradition of the Evolution comes to a dead stop because of a company that doesn’t understand it’s own customers. The Evo X was an thorough redesign only partially implemented… the adjustable suspension bits that were shown in the original concept and scheduled for production never made appeared. And some updates that would be timely will now probably never be seen. Direct Injection and a more powerful processor would cure the mileage issue, and a larger gas tank would help tremendously. Instead, it’s all gone.